September 12, 2011 - Enhanced performance, more power, and a “Grand Canyon” standard of quiet that delivers substantially reduced external noise are all proving to be the new standard in the S-76D& helicopter as the program introduces its third prototype into testing, reported Sikorsky Aircraft. “D3,” the third prototype, recently flew for the first time, officially taking its place in the flight test program to serve as the primary vehicle to certify the avionics and electrical systems. The S-76D helicopter flight test program has achieved more than 500 flight hours to-date with its first two prototypes. All three prototypes were assembled at the Sikorsky Global Helicopters facility in Coatesville, Pa.
Certification testing on “D3” will begin in the 4th quarter of 2011. In addition, flight test data for the certification effort is being collected on “D1” and on “D2.” An Indirect Lightning Test also was completed in August at the Sikorsky Global Helicopters facility in Coatesville, Pa. This certification test simulates lightning strikes to the aircraft to demonstrate that essential avionics and electrical equipment are thoroughly protected. The aircraft continues to demonstrate enhanced responsiveness and the power of its Pratt & Whitney Canada PW210S engines. The S-76D also will be fully certified for flight into known icing – a first for the S-76 helicopter family. “We continue to build on the outstanding legacy of safety and performance of the S-76 product family as we mature the S-76D through test. We are confident that the ‘D’ will be a strong competitor in its class when it enters into service next year,” Fox added. The S-76D helicopter program officially launched in 2005 after an 18-month period of study to identify the key attributes that customers wanted in a new product. “Enhanced safety, avionics and performance were the big requests,” Fox said. The S-76D offers a fully integrated avionics system by Thales® that includes advanced digital maps and enhanced flight systems to deliver an aircraft that reduces pilot workload. 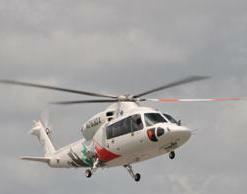 Aircraft certification is planned for the first quarter of 2012, with first deliveries also slated for 2012. The new generation S-76D helicopter will perform an array of civil missions, including executive transport, offshore oil, emergency medical services, and a multi-mission role. Among the S-76D helicopter’s features are all-composite, flaw-tolerant main rotor blades; an advanced THALES integrated avionics system and autopilot; optimized rotor system for quiet operation; active vibration control; powerful Pratt & Whitney Canada PW210S engines; and an optional Rotor Ice Protection System (RIPS) for all-weather capability. Sikorsky Aircraft Corp., based in Stratford, Conn., is a world leader in helicopter design, manufacture, and service. United Technologies Corp., based in Hartford, Conn., provides a broad range of high technology products and support services to the aerospace and building systems industries. Union President Tells Congress "No More, 'It's My Way Or The Runway"